Experienced gardeners know the benefits of pruning, if done the right way and at the right time. Pruning generally encourages the plants to produce more flowers and fruits. One of the essential elements of pruning is the use of an appropriate tool. While some gardeners will say that they are okay with a pair of regular scissors, using the best pruning shears makes a big difference. 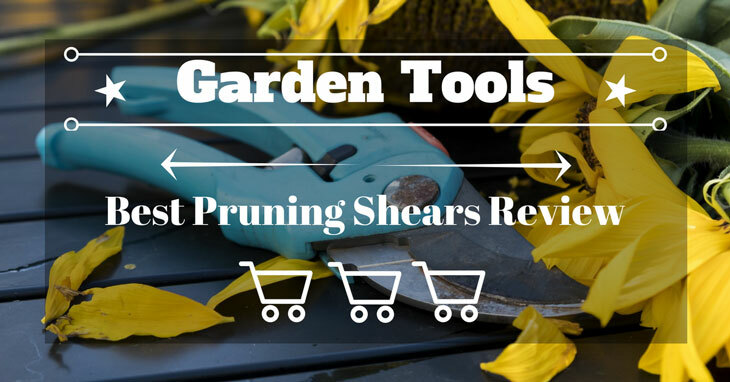 This review will tell you more about pruning shears and how to choose the best kind for your needs. Pruning shears is a type of scissors designed specifically for plants. 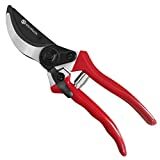 They are designed to have strong blades for use in trimming and shaping plants, deadheading, removing damage small branches and foliage, and cutting back perennials. Pruning shears are considered one of the most useful gardening tools. Even if very sharp, pruning shears generally are not able to cut through anything that is over a half inch in diameter. While some brands claim that they can cup up to 0.75 inch in diameter, doing this requires strong grip strength. Pruning shears come in different styles and features. If you are shopping for one, it can be confusing to compare and get the right one since these tools also vary in price points. Pruning shears are available in 3 different blade designs and each one has its advantages and drawbacks. Anvil pruners – This kind of pruner is characterized by its one straight blade that is making the cut as it closes on a flat edge otherwise known as the anvil. This action gives a similar effect to that of a knife cutting something on a chopping board. One good thing about this pruner is that you can sharpen it from both sides and it remains reliable even when it is slightly blunt. Also, the anvil is generally made of softer material to prevent damage on the blade when it meets the anvil. Anvil pruners are reliable in cutting thick branches. Bypass pruners – A bypass pruner is considered the most popular type of pruner. It works exactly like a regular pair of scissors where two blades pass each other to cut. The only difference is that it has a convex upper blade and the lower one can be straight or concave. Bypass pruners are easy to use and they make very clean cuts. Ratchet pruners – These pruners have an extra mechanism to make it easier for tough cuts. As you squeeze it, it latches so that you can release and squeeze again. It is very useful for cutting thicker stems, performing the cut in easy small steps rather than one go. 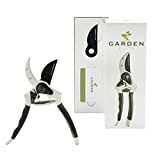 It’s particularly good for those with less strength in their wrist, or for cutting thicker stems that regular shears cannot handle. Talking about good investment, it would be good to get a pruner that allows you to replace parts in case of wear or damage. Many of the cheaper models in the market do not allow you to do this. You can get replacement parts for the more expensive and high-quality pruning shears. Choose a pair of pruning shears with an ergonomic design that requires less pressure to use. It should have a soft-grip handle with angled blades. This will help reduce wrist strain and it will also make your experience easier. The blades of pruning shears are typically made of steel. Some designs have non-stick coating so that it will resist sticky materials such as the sap from plants. The best blades are those that are hardened or made of carbon steel as they last longer and require less frequent sharpening. When buying pruning shears, choose one that has a good locking mechanism as this allow you to lock it in when not in used. The locking mechanism may vary across different models. The best locking mechanism is one that is easy to open and close and does not get in the way while you are using the tool. Choosing the right pair of pruning shears means you should also consider its size and weight. If you are pruning more plants, a heavy tool will cause your hands more fatigue and strain. Make sure also that the handle is large enough to fit in your hand. Additionally, check out the maximum diameter that the shear can comfortably cut. Most pruning shears can cup up to one-half-inch diameter of a branch, but there are those that can cut bigger branches. 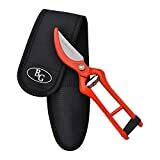 If you are looking for pruning shears that allow you to make clean and smooth cuts every time, the Bevill Garden Professional pruning shears might be for you. This pruning shears can cut up to ¾” diameter of all types of stems and branches. It comes with an 8-inch forged steel high-carbon blade with steel construction to keep the blades razor sharp even after frequent use. Not only that, it is also chrome-plated to prevent rust. The Beville Garden Professional Pruning Shears are ideal for florists, landscapers, crafters and homeowners. This tool’s non-slip grip handle makes it safe and comfortable for daily use. It also fits small and large hands and could be used by right- or left-handed users. Moreover, it has a reliable tension spring to ensure a consistent rebound. It is also fitted with a rubber closure for safety when not in use. And if you buy this tool, you also get a free fold-over flap, 9" holster that has a belt loop so you can conveniently carry it around. It uses a leather loop as a closing method and some users say it is a bit short and could disintegrate over frequent use. The SunJet pruning shears are another great gardening tool that is known of its ease of use and overall durability. It is made of forged aluminum handles with a screw-mounted anvil blade that is constructed from high-quality SK5 steel. One of the best features of this pair of pruning shears is its ergonomic handle grip which has an anti-slip and shock-absorbing pads. This feature can give you a better experience as it reduces hand strain and fatigue even after long use. It also has a locking device to keep the blades from opening if you are not using it. This is an important safety feature worth considering. Moreover, this product just weighs 7.2 ounces but is extra durable as its body is made up of drop-forged metal aluminum. This pair of pruning shears is ideal for making fine and delicate cuts which make it very useful for flower-arranging as well as for cutting twigs, small branches and buds. When you buy this item, it comes with a wire-cutter through a notch, allowing you to cut small wires without destroying the blades. It also comes with a juice rim to prevent the blade from getting sticky. If you are suffering from arthritis and find it difficult to prune your plants, this tool might just be for you. 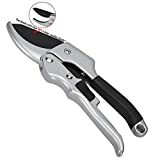 The Gardener's Friend Pruners, Ratchet Pruning Shears promote quick, clean and easy cutting without giving you a hard time. 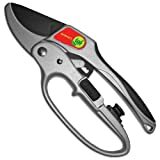 This product uses a ratchet mechanism, allowing you to make cuts with a fraction of the effort you would otherwise use with conventional pruning shears. This is an ideal tool for those who are always trimming shrubs, flowers and trees. Moreover, this tool has an ergonomic design that makes it great for senior gardeners. Aside from its 3-stage ratchet action, it also comes with a soft rubber hand grip that absorbs pressure while working. This will help you make tough cuts easily. Its design is also ideal for both right- and left-handed users. As for its blades, they are coated so that they do not become sticky as they slide through wood. The anvil coating also prevents the blades from getting dull. Moreover, the blades are made of hardened carbon steel to ensure that they stay sharp even after many uses. Its body is made of lightweight aluminum that resists rust. And the best thing is that its blades are replaceable. Another product worth considering is the Lendgaga Professional Bypass Pruning Shears. It is a versatile tool that can be used for pruning trees, flowers, shrubs and bonsai plants. Its blades are made of SK-5 steel which is known for its strength, durability and resistance to rust and corrosion. Among the notable features of this product is its pulley and spring loading design which makes pruning tasks a lot easier. The pulley increases the amount of pressure you exert whenever you make cuts. This will reduce the force that you need to apply. Not only that, this product is also lightweight and has an ergonomic aluminum alloy and anti-skid handle. With all these features, you can avoid hand strain and soreness even with prolonged use. Another good feature of this pruning shears product is its hand lock that protects the blade from damage when you are not using it. Also, the blades are replaceable so you don’t have to discard the entire tool if a blade is damaged. This pruning shears product has a blade that is extra durable as it is constructed from high-carbon Japanese SK-5 steel which is one of the hardest steel materials used for cutting tools. This kind of blade allows for fast, easy and clean cuts. The blade has also a non-stick Teflon coating to prevent the blade from sticking or gumming with sap. It also makes the blade corrosion and rust-resistant. When you purchase this product, it comes with an extra blade for replacement. As for comfort and ease of use, this pruning shear offers both. It is lightweight and does not require much effort to make cuts. Its handle has a forged aluminum handle with non-slip rubber grips for a secure and comfortable grip. It also has a reliable locking mechanism to keep it secure if not in use. One of the features that you will love about this pair of pruning shears is that you can easily disassemble it for easy cleaning. Based on overall features and price, the best pair of pruning shears are the Lendgaga Professional Bypass Pruning Shears. This product uses one of the most durable and strong materials for its blade – the SK-5 steel. This material is also resistant to rust and corrosion. Moreover, this product uses a unique pulley design so that you will not have to exert much effort when pruning. Its overall design is also ergonomic to ensure a better user experience. You can also easily disassemble it to clean or replace the blade. On top of that, it comes with a 100% satisfaction guarantee.